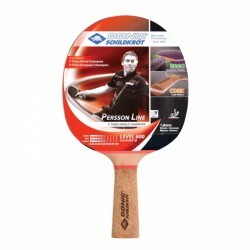 The Donic-Schildkröt table tennis bat Persson Line 600 is a high-quality all round bat of the Persson Line, which is developped in cooperation with the multiple world champion Jörg Persson. The highlight of the table tennis bat is the ERGO handle with a rounded, smooth transition from handle to bat blade. The handle is comfortable to hold and avoids pressure marks on the pointer. The ERGO handle is made of cork, which provides a very good sweat absorption due to its natural features and provides hence a safe bat use as well. The 1.8 mm strong sponge between coat and wood, the so called "motor" of the bat, achieves a very good ball control and a lot of power. The thicker the sponge, the more power the bat offers.